A telematics gateway connects the physical vehicle and its environment to an IT, often cloud-based, ecosystem. This single device provides the driver and the command center access to critical operational information via various networks such as local (Bluetooth, Wi-Fi) and cellular (LTE). Being able to pull the data into third-party applications offers the flexibility for unlimited uses such as vehicle and driver monitoring or vertical-specific industries requiring smartphone, tablet, driver ID systems and other integrations. Enter CalAmp’s LMU-3640. It joins a family of devices that are key components of building successful vehicle gateways. 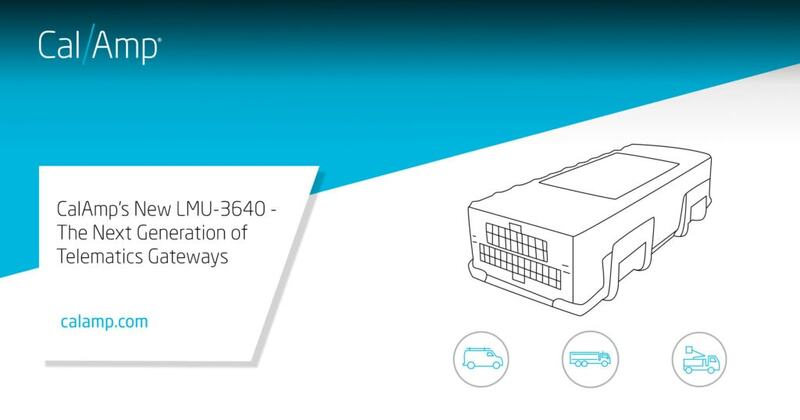 The LMU-3640 has a flexible and expandable embedded architecture to grow with your fleet by supporting various vehicle interfaces and protocols. By using the LTE 4G network, you are protecting your fleet from sun setting cellular technologies. If you have a mixed fleet of heavy- and light-duty vehicles, the LMU-3640 works with both so there is only one device type to manage. The internal antenna enables faster installations. The LMU-3640 family helps you build a vehicle area network (VAN) to process additional data from Bluetooth Low Energy devices and peripherals. A VAN helps improve situational awareness for drivers, operations managers and fleet managers. These devices also have backup batteries with ultra-low current consumption when inactive. This feature helps ensure reliable connectivity regardless of the situation. In summary, the LMU-3640 integrates the light- and heavy-duty vehicle BUS that helps consolidate the number of device types needed. This device consolidation further simplifies a fleet’s supply management and operations. The expanded processing environment allows the flexibility to build custom applications to leverage the vehicle bus data beyond the location base and accelerometer data. The LMU-3640 has a high performance LTE network for faster updates using CalAmp’s PULS tools. It also future proofs against the upcoming 3G shutdown risks. The internal antennas drive down the cost and complexity of installs. It also has an optimized form factor for install locations. Learn more about CalAmp’s LMU-3640 telematics solution here. Contact us here if you would like to discuss your challenges with our team.